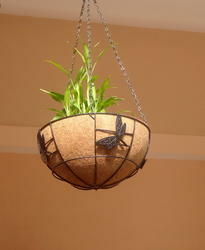 Coir Hanging Basket are made from natural coconut coir fiber. Coir Hanging Basket are 100% biodegradable used for home/office decorative gardens. Better water retention, aesthetic and natural look than plastic or other material. 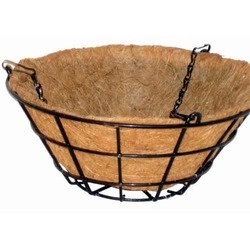 Black Round Hanger Planter 10" Leaf, Size: 10"
Enriched with years of experience in the industry, we are engaged in offering Coir Hanging Basket. Coir hanging baskets are used for internal gardening and acts as decorative materials to the buildings. Less weight and organic properties of coir makes them viable for internal gardening. Plants grow faster and healthily in coir baskets. 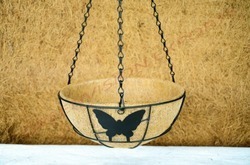 Coir hanging baskets are made from coir fibre blended with natural rubber. Coir hanging baskets are Less weight and makes them viable for internal gardening. Plants grow faster and healthily in coir baskets. To meet the variegated requirements of the customers, we are instrumental in offering standard quality array of Coir Hanging Basket. compound grow bags, hangs it in your home! These are available in different grades and size in a variety of porosity combinations that allow varied water content to the plants on daily or seasonal basis. Made out of coir fiber. Eco friendly, and easy eye catch. Plants gives you good oxygen.